Murry Salby is doing a tour of the UK that is being promoted both by Bishop Hill and by ScottishSceptic. One of the ideas promoted by Salby is that the rise in atmospheric CO2 is natural and not anthropogenic. As pointed out by Tom Curtis, there are 10 lines of evidence why this is wrong. There are also other things presented by Salby, that are easily shown to be wrong. I’ve mentioned them before, so won’t go into detail here. However, it is now my view that claiming to be a skeptic while also considering that Salby’s ideas have merit are inconsistent positions. It is not difficult to show that his ideas are wrong. What Murry Salby is largely suggesting is that the rise in atmospheric CO2 is natural. The biggest sink of CO2 is the ocean. The amount of CO2 that the ocean can absorb depends on temperature and so, one possibility, is that the rise in atmospheric CO2 is driven by the oceans releasing CO2 as temperatures increase. This is governed by Henry’s Law, so in an attempt to be skeptical, I thought I would investigate what Henry’s law can tell us. I should make clear though, that a week ago I knew of the existence of Henry’s Law and roughly what it related to, but not much more. So, what I present in this post could be nonsense and I’m more than happy to be corrected by those who know more than me. I’m simply presenting an attempt to be skeptical (investigate) what Henry’s Law can tell us about the relationship between temperature and atmospheric CO2 concentration. So, if the temperature is 288K, then kH = 22.15 L atm/mol. If we consider pre-industrial times, then p = 280 ppm = 280 x 10-6 atm. From Henry’s law then, c = 1.26 x 10-5 mol/L. If we know the volume of the ocean involved, then we can determine the total mass of CO2 in that region of the ocean, given that 1 mole of CO2 is 44g. Okay, so the above tells us the concentration in the layer of the ocean that was exchanging CO2 with the atmosphere in pre-industrial times. There are two things I would like to know. How do atmospheric concentrations change with temperature, and what happens if we increase the total amount of CO2 through our use of fossil fuels? Doing this requires two more assumptions. One relates to what happens to the CO2 in solution. The CO2 reacts with water to produce HCO3 and CO32-. Only about 0.5% is in the form of CO2 itself. Therefore, what I’ve assumed is that the total mass of carbon in the region of the ocean that exchanges CO2 with the atmosphere is 200 times greater than the mass of the dissolved CO2 determined using Henry’s Law. So, the layer of the ocean that exchanges CO2 with the atmosphere is about 100m deep (at least that’s what I estimate). 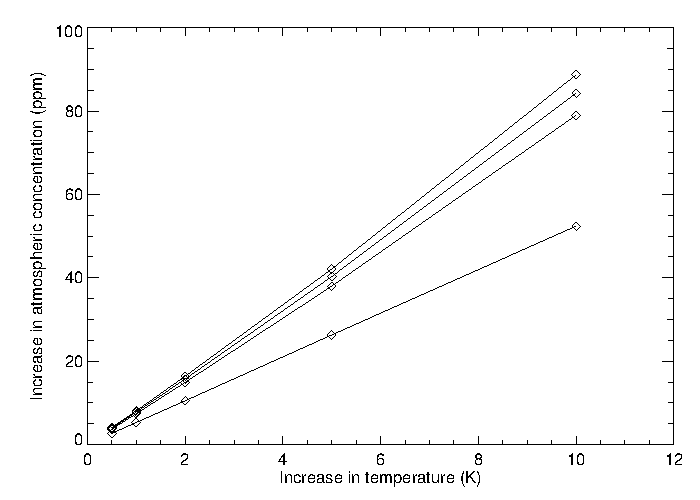 So, now we can determine how the atmospheric CO2 concentration should change with temperature. We’ve already calculated the mass in the ocean layer. The mass of CO2 in the atmosphere can be determined using 1ppm = 7.81 GtCO2 = 7.81 x 1012 kg. We now have the total mass (that must be conserved) involved in this process. I can vary Henry’s constant using the second equation in this post. All I’ve done then is write a short computer code that, for a given new temperature, varies the atmospheric concentration until the total mass at the new temperature matches the total mass at the old temperature (if anyone would like a copy of the code I wrote, I’ll happily email it to them. It is in Fortan though:-)). Although I calculate that layer thickness to be about 100m, I’ve also repeated the calculation for layer thicknesses of 500m, 1000m, and 3800m (essentially the entire ocean). The results I get are in the figure below. Increase on atmospheric CO2 concentration against increase in temperature for ocean layer thicknesses of 100m (lower curve), 500m, 1000m, and 3800m (upper curve). The result suggests that if a 100m layer of ocean is exchanging CO2 with the atmosphere, then a 1oC rise in temperature should increase atmospheric CO2 concentrations by about 6ppm. This was a little surprising as I had thought that it was more like 20ppm per degree. So, maybe I’ve made a mistake or some of my assumptions are just too simple. However, even if I assume that the entire ocean is exchanging CO2 with the atmosphere, I only get a rise of 10ppm for a one degree rise in temperature. So, even if I’m wrong by a factor of 4, the most extreme possible case comes nowhere near producing a 120 ppm rise for a one degree increase in temperature (as would be required if Salby’s ideas have merit). The other thing I considered was what the atmospheric CO2 concentration would be if we assume a one degree rise since pre-industrial times (I know it’s slightly less, but this is just a test), an increase in the total carbon content due to our use of fossil fuels (240ppm x 7.81GTCO2 = 1.87 x 1015 kg), and an ocean depth of 100m. If I do this calculation, I get that the atmospheric CO2 concentration should be 372 ppm. So, not quite what we actually observe, but pretty close. If I’m not completely wrong, then one can use this to estimate how much the atmospheric CO2 concentration should rise with increasing temperature. There appears to be no way that the 120ppm increase that has occurred since the mid 1800s could be natural. My most extreme estimate is that natural processes could only have produced a maximum rise of around 10 ppm. This does seem a little low, though, but to get 120 ppm per degree would require something to be very different from what we expect. If we consider how our emission of CO2 since pre-industrial times would have influenced the atmospheric CO2 concentrations, what I’ve done here suggests that it should have increased it by close to 100ppm. I know this is slightly less than what is actually observed, but it’s pretty close and this is, very clearly, a very simple calculation. So, why have I done this? Well, partly it’s just fun to try something new. I think I understand Henry’s Law better than I did before. Now that I do, I can’t see any way that the rise in atmospheric CO2 could be natural. I can, however, now show that it is largely consistent with being anthropogenic. I also think I can now talk from a slightly stronger position when I discuss Salby’s ideas with others. I’m not just taking someone elses’s word it, I’ve actually done some calculations of my own. Of course, I do acknowledge that there is a chance that I’ve made some kind of embarrassing blunder or that some of my assumptions are wrong. That, however, is what the comments are for. This entry was posted in Climate change, Global warming and tagged anthropogenic emissions, Anthropogenic Global Warming, atmospheric CO2, atmospheric co2 concentration, Bishop-Hill, Henry's Law, Murry Salby, Scottish Sceptic. Bookmark the permalink. It is obvious that Henry’s Law is a hoax, because Al Gore is fat. The fundamental problem with the notion that CO2 is coming out of the oceans (other than the fact that the isotopic composition is incorrect for that to be a significant contribution!) is that we know from direct measurement of ocean bicarbonate/carbonate/proton concentrations, that CO2 is being absorbed by the oceans in truly humungous amounts, amounting to around half of our emissions. Clearly if the oceans are a large net sink for CO2 they cannot at the same time be a net source! Indeed, I should have said that. There are many ways (and much easier than writing a code to investigate Henry’s Law) to show that the source cannot be natural. It was just quite fun to learn something new. ….and considering your use of Henry’s law in the context of the last glacial to interglacial transition between 15,000-10,000 years ago, if one observes that the globally-averaged temperature increase was around 5 oC (glacial to interglacial) and the atmospheric CO2 rose from around 170-260 ppm during the transition, and that the transition (around 5000 years) was slow enough to allow the ocean/atmosphere distribution to come to equilibrium, then one can get a ballpark figure that 1 oC of temperature rise yields of the order of an 18 ppm increase in atmospheric CO2. Of course that is all moot, since we know that the oceans have massively absorbed CO2 during the industrial era and so they are net sinks and not net sources of CO2. Of course the rise in temperature will be suppressing the ability of the oceans to absorb CO2 according to Henry’s law, and presumably this is a problem (as well as the expectation that the absorption of CO2 by plants will start to be suppressed as the world continues to warm), since the so-far-favourable absorption of ~50% of anthropogenic CO2 emissions is increasingly unlikely to continue . Yes, I had thought it was something like 18 ppm per degree. As you say, not only have the oceans been net sinks of CO2, their ability to absorb CO2 decreases with increasing temperature. Ah, but Salby dismisses the ice core records, so that argument will just be waved away by him. Of course that means ignoring the problem that his proposed CO2 release/degree warming would make the CO2 concentration during an Ice Age negative (as John Nielsen-Gammon noted some time ago), but who cares about such details, right? I really enjoyed John N-G’s comment where he pointed out that Salby’s idea would imply times when CO2 concentrations were negative. JN-G’s takedown is (for me, at least) definitive. A one-shot Salby debunk. Althoght Wotts, please do not take this amiss. The investigation into Henry’s Law above is very interesting and stands alone, IMO. Salby simply provides a running gag to go with the physics. I hope you escaped the fun and games with the weather last night unscathed btw. If Salby wants to challenge the reliability of the ice core CO2 (and presumably CH4) reconstructions, he needs to stop talking and get his claims published in a reviewed mainstream journal. Otherwise what he says remains scientifically weightless and eminently ignorable. Since he must be aware of this, the absence of publication is odd, to say the least. Especially as he has gone very public over this. The weather didn’t affect us fortunately. Hope the same is true for everyone else. If only Nielsen-Gammon, Tom Curtis and others were a significantly visible factor, the sanctity of the public mind as a place unsullied by rubbish would be ensured. The trouble is, the vandalism inflicted on the public mind by Salby is like graffiti on brick; it’s practically impossible to eliminate all traces of the mess. All that’s necessary is to create something roughly resembling reasonable doubt and Salby’s mission is successful. What amazes me is the “one-way mission” stakes Salby is taking on with this tour. Quite clearly he simply doesn’t give a fling what his erstwhile peers think of him. I suppose that’s not surprising, considering how little residual value remains in his CV if his recent career history is examined in detail. I don’t think the path to correcting public estimation of Salby’s opinions lies in discussion of the underlying science. Gossip based on unflattering facts is probably equally if not more effective. Doug, I’ve only just encountered John N-G but so far I’m impressed. I agree with you about Tom Curtis. He has a remarkable understanding of climate science and an excellent way of explaining it. If he was more visible it could have a very positive effect. As far as Salby is concerned, I’ve been trying to avoid the “gossip” (although it does appear to be documented and correct) because I don’t need to use it to show that he’s simply wrong. I have wondered if we could develop a Salby index, which would be based on how credible someone thinks Salby’s ideas are, and which can then be used to determine whether someone is a genuine skeptic or a pseudo-skeptic. A Salby index of 0 would mean that you think Salby’s ideas have no credibility. A Salby index greater than 0 would imply that your skepticism is more wishful thinking than anything else. I guess it would just be a binary index. Here’s a helpful hint for the public, when they come to deciding whether Salby is useful. We conclude that the Subject (Dr Salby) has engaged in a long-running course of deceptive conduct involving both his University and NSF. His conduct reflects a consistent willingness to violate rules and regulations, whether federal or local, for his personal benefit. This supports a finding that the Subject is not presently responsible, and we recommend that he be debarred for five years. Our investigation revealed that the subject (Dr Salby), consistently and over a period of many years, violated or disregarded various federal and NSF award administration requirements, violated university policies related to conflicts and outside compensation, and repeatedly misled both NSF and the university as to material facts about his outside companies and other matters relating to NSF awards. Most of the public are not conspiracy theorists and won’t be able to shrink-wrap their minds around some beneficially expedient fiction to explain this. Where’s the science? Who cares? Knowing Salby’s history is an excellent reason not to choose not to waste time exploring all the many ways he’s wrong. He’s simply not a reliable person, at least according to a very careful examination by the NSF. Yeah, Tom and John N-G share something important in common: they’re both unflinchingly honest to the very best of their capacities, not willing to yield an inch to cosmetic treatment of their subjects. It’s a glaring difference to the subject of your post. I actually hadn’t read the document linked to in John Mashey’s post. It’s quite a remarkable indictment of Salby’s behaviour. As much as I’ve tried to focus on how his science is wrong, rather than on his behaviour, I’m starting to agree that it is amazing that anyone could regard him as someone who’s ideas should be given any credibility. Indeed, it is an excellent and really straightforward debunking of Salby’s idea that the rise in atmospheric CO2 could be natural. Slightly OT, but as you have only recently come across JN-G, Wotts, may I drop a link to his post last year about the “hiatus” and ENSO? At the time, I found this perspective illuminating. Wotts should feel free to nuke my remarks; they’re arguably a bit whiffy compared to the intentions of the blog. Blame it on case-hardened cynicism caused by watching the great wheel of futility turning too many revolutions. Shortcuts shouldn’t be the preferred method of taking out the trash. Not on my account Doug. Your link and quotes are part of the truth. They are part of what people need to know. Ignoring all the flattery, I have two comments regarding the OP. First, it is clear that for atmospheric concentrations of CO2 to be set by temperature regardless of the rate of human (or volcanic) emissions, Salby has to assume that atmospheric concentration has no impact on the rate at which CO2 dissolves. That is, he requires that Henry’s constant very closely approximate to zero. Even then, as noted above he falls a cropper of the inconvenient fact that concentrations of Dissolved Inorganic Carbon (DIC) are increasing. Second, CO2 or CO2 related products (ie, DIC) in the ocean are very complicated, with only a small portion actually being dissolved CO2 (see here, and follow links, for a very readable primer). I really don’t understand the chemistry enough to determine how this complex chemistry impacts on applications of Henry’s law to CO2 in the ocean. However, because of this complex chemistry I would tend to regard simple applications such as that above as only ball park estimates, unless they came from a chemist who was up on the details of chemistry of CO2 on ocean water. I agree with you completely about the chemistry. I should probably have commented on it more in the post but something that I did learn in reading up on this is that it does indeed seem to be quite dependent on the detailed chemistry and so I too would only regard what I’ve done as a ball park estimate rather than anything else (in fact, I would only really regard it as a learning exercise for me that I’ve written a post about). However, I will say that I have yet to find a set of parameters that will give a CO2 rise consistent with what we have seen in the last century and that isn’t anthropogenic. It discusses processes from smallest to largest scales, with useful descriptions of dominant features at each. From 1999; has much changed or have there been big upheavals in understanding? I don’t know, but it still seems quite informative. As it’s a review there are lots of references to more ninky treatments. That is the frustrating thing about arguments like Salby’s. There is literally no evidence in its favour, and a vast array of evidence against his hypothesis. Further, unlike much of the evidence in science (which is elegant, and delights me with the subtlety of the minds that can tease it out), the evidence that the recent rise in CO2 is anthropogenic is straightforward and intuitive. Denying the anthropogenic origin of the rise of CO2 is literally the intellectual equivalent of denying that the Earth orbits the Sun, or that it is not flat. Yet so committed are some people to not accepting the possibility of significant future temperature rises caused by humans that they do not flinch at accepting the absurdities. Exactly, it’s what’s made me decide to be somewhat harder on those who respond with comments like “well, maybe it could be right” or “we should consider everything”. No, that’s not skepticism, that’s simply wishful thinking. Some things are just wrong and can be easily shown to be wrong. If you can’t work out that Salby is wrong, then you should recognise that your understanding of basic science and basic numbers is insufficiently good to be engaging in discussions about climate science. Doug Mackie has an excellent (and really in-depth) discussion of ocean acidification and CO2 solubility in the oceans on SkS. Note that post 11 has the most detail about the anthropogenic component of CO2 versus the oceans. Your wish will be granted fairly soon, in the followup Part 2 that goes with Defamation By Internet? Part 1 – Murry Salby’s Short-Lived Blog Storm. – Macquarie University is bad, and so is The Team, Lewandowksy, TRenberth, Obama, Gore, etc, many of whom must have had something to do with Salby’s dismissal. – Climate science is a hoax, run by an international cabal. – Lysenkoism, Nazi, Stalinist, warmista attack dogs, etc. -Another Climategate, maybe even bigger! The force (of paranoia & conspiracist ideation was strong). This started ~3PM Sydney time with blog post, while MQ was on break. Many expressed suspicion that MQ had not replied in great detail by the next morning. Almost no one had any clue about confidentiality rules and need to have lawyers review such things. People opined that MQ had purposefully lured Salby to Australia explicitly to obstruct his dangerous research that threatened the AGW relgiion. That Salby was hired in 2008, and showed zero evidence of odd CO2 ideas before 2011 merely led to idea that his ideas must have been known before. Some noticed that Kevin Trenberth worked in Boulder, so he must have been involved. That got: “And The University Corporation for Atmospheric Research (UCAR) is a nonprofit consortium of more than 75 universities manages the National Center for Atmospheric Research (NCAR) Trenberth is head of NCAR.” (Kevin is not and never has been head of NCAR, irrelevant anyway.) etc, etc. 2) Small minority agreed with much, except said Salby’s science was flat0out wrong. One even apologized for saying so, noting they’d get voted down. 3) Another minority agreed with much, but showed credible (real) skepticism towards Salby’s MQ story, noting that it was an employment dispute of which they’d heard one side. 4) There was a tiny minority of “known outsiders” who knew Salby was wrong on the science, didn’t think AGW was a hoax, and didn’t know exactly what happened at MQ, but saw enough contradictions in Salby’s story to raise doubts. These were generally subject to repeated insults, such as “Aren’t you late for your appointment at the euthanasia clinic”. 5) MQ first press release came out, Those in group 1) mostly ignored or criticized it. 6) A few days later, MQ’s 2nd press release came out, as well as the 2 DeSmogBlog posts. A few fought on, saying the NSF had no case, etc, etc … but after 1600 comments in 4 days … suddenly the topic became uninteresting… and comments mostly stopped. Anyway, it makes for an utterly delightful record – I’ve got all this accumulated in a 350-page file, highlighted and annotated so one can easily search for the common memes. Soon. Assume the Earth is shaped like a cow…. Thanks for this analysis. Salby is clearly wrong and its embarrassing that so many people give him credence. I guess the question in my mind is why is this an important issue. Salby will go away soon because he has no real power and a very “lukewarm” following. Even those who want to let him speak are not really convinced I think. A much weighty matter is the IPCC and the mainstream climate science and any issues they have not gotten right. If indeed we need radical policy changes, and I’m not completely convinced, it would seem that in fact the last 20 years of advocacy are by any objective standard a failure as emissions keep rising and prospects for meaningful changes are not really credible. The problem here is so much bigger than just poking fun at irrelevant stuff. Well, firstly, maybe Salby will go away but this is relevant because he is due to talk in the UK and one of the locations is the House of Parliament itself. The other point is that his tour is being promoted by two UK bloggers who claim to be skeptics and honest brokers. If they are, why are they promoting a tour by someone who’s past talks on this subject are trivially incorrect. That’s not skepticism, it’s wishful thinking. A much weighty matter is the IPCC and the mainstream climate science and any issues they have not gotten right. I now think I understand this topic quite well. I’m unsure of what the IPCC and mainstream climate have got wrong. Clearly they haven’t got everything right. That’s normal for a complex science area. What I see are a group (not necessarily organised in any formal way) who are not especially qualified in this area who go around telling everyone that there are problems with the IPCC. I’ve yet to discover what these problems are myself or to see the relevance of those highlighted by some people. So, you’re saying, as a result of your simple assumptions, you got a straight answer, and that your margin of error includes you being completely wrong? Temperature dependence of CO2 is incontrovertible. The immediately temperature-sensitive soluble fraction is a small component.There are however several pools that are in equilibrium with this fraction, at several time scales. They, and not the soluble fraction directly, will determine the longer scale response. All your Henry’s law derivation shows is that the fast, temperature-driven soluble fraction is a small component. Shub, are you seriously suggesting that the CO2 rise could be natural? Add Judith Curry’s promotion of Salby on her blog. Most hilarious (to me) was her citing Andrew Bolt, and referring to blogs of Jo Nova and Chiefio. Note that this “irrelevant stuff” is thus promoted by someone who has been used as witness by the Republicans in hearings about climate change (which are then used to prevent any significant policy measures on CO2 emission reductions). Thus, this “irrelevant stuff” has at least an indirect relevance to policy. Will Murry Salby be as forthright as Wotts, and point to possible errors in his calculations? Will be mention the objections to his work from climate scientists who also work in this field? Will be explain why his work has never got into a peer-reviewed journal? The biggest problem in argument is fighting your opponents’ background assumptions. Which is why I try to write as literally as possible. Please read them literally as well. I thought I was. The temperature dependence in the ice-core record is that it should be around 18ppm per degree. I acknowledge that in the post. I get 6ppm per degree. I don’t know why it’s different. Probably because my model is far too simple. Either way, there appears to be no way that the rise in CO2 can be natural. My reason for saying I could be completely wrong is that I’ve never worked with this before. Hence, I’m open to the possibility that I’ve made a fundamental mistake. If you think that being far more confident in one’s conclusions gives someone more credibility, then fine. I happen to disagree. What confuses me about your comment is that it appears to show a level of understanding about this topic. How can you have some understanding of this topic and not be able to answer the simple question I asked you earlier in this thread? That’s interesting (that Judith Curry should cite Andrew Bolt and Jo Nova). I’m sure I’ve seen her mock people who cite Skeptical Science. Salby is questioning the attribution argument constructed to derive anthropogenic CO2. This is slightly different from saying “Man did not emit CO2”. Salby’s work is unpublished. All he’s showing us are his result diagrams. Is it possible that larger excursions of CO2 are not in the ice core record? If we assume Salby is correct (to any non-trivial degree), the answer is yes. We know there has been a temperature rise in the past ~200 years. Could this rise therefore have contributed to a CO2 rise? Yes. Is it possible that natural sources dilute out 13C in the same way fossil fuel burning does? I don’t know, but Salby’s claim is that it is possible. Taking the two points above, is it possible that there is a contribution from natural sources? Yes. How big is it? I don’t know. Salby’s own conclusion is to say it is significant enough to say that the IPCC’s derivation of anthropogenic limits of contribution, cannot be correct. My own question is: Is there a natural contribution of CO2 vis a vis Salby (given *his* arguments), and if so, how big is it? Obviously it will be superimposed on the anthropogenic addition because it occurs in the same time period. The Links hotel is quite small, I remember going in their bar once years ago. Shub, let me try and give you a serious answer. In the absence of anthropic emissions, a 1 degree rise in temperature would produce something like an 18 ppm increase in atmospheric CO2. Therefore, one might think that the 120 ppm rise we’ve seen since the mid 1800s is 100ppm anthropogenic and about 20ppm natural. Here’s the problem though. If you consider Henry’s Law, it tells you the balance between the concentration of CO2 in the oceans and the partial pressure in the atmosphere. So, we emit enough in the last 170 years for atmospheric concentrations to rise by at least 240 ppm. What happens, however, is that some of this dissolves in the ocean, is then involved in chemical reactions (producing HCO3 and CO32- for example) and the system will evolve towards an equilibrium. The equilibrium at the moment is that atmospheric concentrations are 120 ppm higher than they were in the mid 1800s. None of this is natural. It’s all a consequence of an equilibrium that takes into account the rise in temperature and the increase in total CO2. So, really there isn’t a natural component to the rise. Another way to look at this is that everything has gone up, atmosphere and oceans. That all has to be because of anthropogenic emissions. How can there be a natural component to this? If that is the case, the next step would be proceed to prove (to the extent possible) that is indeed the case, which in turn would show Salby wrong. Your derivation, on the other hand, uses only the soluble fraction, and is based on large part, that heating the oceans must outgas and release CO2 and that must be the only (or major) source/mechanism of temperature-driven CO2 rise. Shub, I don’t understand what you mean when you say my calculation uses only the soluble fraction. It include a perfectly reasonable estimate for the other components involved in the chemical reactions. I’ve even tried different and extreme ratios and cannot come close to producing anything like a 120ppm increase through natural processes only. Furthermore, you don’t need to do this calculation to prove Salby wrong. There are multiple lines of evidence. He really is wrong and if you don’t realise this, you should seriously give some thought as to whether or not you really understand any of this well enough to contribute to a discussion about climate science. Shub, It would be helpful if Salby suggested what proportion of the vastly increased atmospheric [CO2] in the industrial era he considers is “natural”. Has he done this in your knowledge? Clearly if he thinks it might be 1% or 0.1% or whatever then that would be quite interesting to know. Obviously it is pretty much impossible for it to be an amount of any significance since we know categorically that oceans are a vast net sink of CO2 in the industrial era, and the natural net release from the fauna is very small (we can assess this from the very small [CO2] rise in the pre-industrial era associated with quite large amounts of forest clearance in Europe and elsewhere, and the fact that existing fauna and soil is still a small net sink of [CO2]). Obviously quite a bit of atmospheric [CO2] has come, and continues to come, from forest clearance especially in the central latitudes, but this is anthropogenic CO2, and we know from analysis of carbon isotopes (14C in particular) that this is still a small (but significant) component of the massive rise in [CO2] in the industrial era. In fact Wotts suggestion from use of Henry’s law that up to 20 ppm of increased atmospheric [CO2] might arise from the temperature response of the oceans needs to be considered with some subtlety, since this particular application of Henry’s law relates to the temperature response under equilibrium conditions in which [CO2] redistributes between oceans and atmosphere acording to temperature (“equilibrium” in this sense relating to a fixed pool of [CO2] in the ocean/atmosphere system). The massive anthropogenic enhancement of [CO2] makes application of Henry’s law more complex since mass-action is “pushing” back against temperature-derived [CO2] outgassing. In other words the industrial temperature rise hasn’t directly contributed to the enhanced atmospheric [CO2] by temperature-induced [CO2] outgassing (since the oceans have accumulated net CO2 so there hasn’t been any net out-gassing!). The enhanced temperature has suppressed ocean uptake of CO2 and so the temperature effect on enhanced [CO2] is an indirect one in present circumstances. Well, let me be honest too. I’ve never encountered anyone attempting to solve global climate with Henry’s law. There are biologic processes that cycle several dozen to thousand times, or even more, that are in no way in equilibrium with the fraction that will be driven by a Henry’s law dependent manner. These processes themselves, at the same time, are temperature-dependent as well. They are not included in your calculation. Is it a surprise the numbers don’t add up? Don’t discuss science with someone who doesn’t buy Henry Law and/or other mathematical simplifications as reasonably representing climate processes. The temperature-correlated CO2 variation in the ice cores lags by an order of hundreds of years. Does that sound like a Henry’s law process to you? Notice that no one is “attempting to solve global climate with Henry’s law”. That’s a another trolling comment sadly. Neither Salby nor you (as one of his vociferous supporters) chooses to address either the mechanism nor the quantitation of his supposed natural contributions. Wotts is pointing out that simple physics puts limits on temperature-induced ocean outgassing of [CO2]. That’s quite a scientific approach. Of course we know categorically that that limit is in fact superceded by the observation that the oceans have been a truly massive net sink for CO2 and have made zero contribution to the enhanced [CO2] in the industrial era. Lag of [CO2] with respect to temperature is what one would expect from application of Henry’s law to temperature-dependent ocean outgassing. Can you formulate your particular problem with that? It’s quite straightforward I would have thought. For starters, as I’ve made clear on numerous occasions, this post is just about my investigations using Henry’s Law. I draw some conclusions, but not much more. The lag in the ice core record is, I believe, because of the slow release from the deep oceans. Clearly I haven’t included that here and it may explain why I get 6ppm per degree and the ice core record suggests something closer to 18 ppm per degree. It’s largely irrelevant though. You can’t explain the rise in atmospheric CO2 as being natural. Shub, you seem to be starting sub-threads. So I’ll repeat my comment addressing your sub-thread, here where it’s equally relevant! Please sign up and attend. I suspect this one won’t be video’d, so I’ll be curious to know if this version will have differential equations as in Hamburg. Finally, if you have a good time, you might thank John O’Sullivan of the PSI “Slayers” group, who apparently initiated this trip, see July post and Itinerary for the UK tour, except Scotland.. Yes, of course it sounds related to Henry’s law – the point is that the earth warms up, and that causes the release of more CO2 from the oceans, which gives more warming. It’s called positive feedback. Needless to say, the science is well-established, as per earlier discussion and cites to john N-G, Colin Prentice and Eric Wolff. But I will mention one more, since Bill Ruddiman will be giving the Tyndall LEcture at AGU in December) on topics including the following. See Can natural or anthropogenic explanations of late-Holocene CO2 and CH4 increases be falsified? from The Holocene. p.3 has graphs of CH4 (CO2) which were decreasing until ~5,000 (7,000) years ago … versus insolation-aligned past interglacials, amidst discussion of why that is the right way to do it. Sumary graphs are on p.7, showing our interglacial versus the average++/- 1 SD. Without humans, CO2 would have been around ~250PPM about start of I.R, and heading slowly downward with usual jiggles, instead of 280PPM. Humans raised the CO2 concentration ~30PPM over what it would have been, but that took ~6,000+ years. 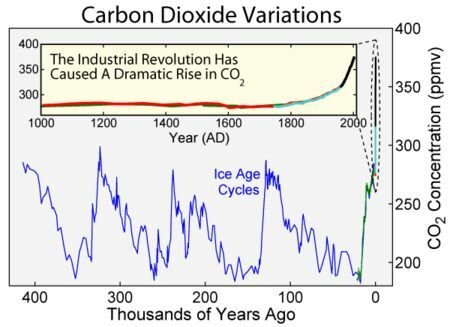 Thought exercise: print a copy of p.3, now extend the CO2 graph with the 250-year post-I.R., record to present (~400PPM) which basically is a vertical line 2.75″ long, extending to the top graph, about on level with CH4 650PPB. Likewise, CH4 has gone from ~700PM ~1750 up to ~1800, way off the sheet of paper. One might ask: when did anything like that happen in the last 800Ky or so? People can just chant “it’s all natural” over and over, because Salby writes differential equations and graphs that say so. Right. Well, to be brief, I would start with sensitivity estimates. The range is large and has not gotten smaller in 30 years. It got larger from AR4 to AR5 and I guess there is no longer a most probable estimate. Seems like uncertainty is growing over time. Then there are the GCM’s used for projections that are not showing tremendous skill. This is all well documented in the literature and in fact in the IPCC report where best estimates are seemingly arbitrarily lowered relative to the model mean for the next decade I think. A lot of mainstream scientists are saying the IPCC is too alarmist, using their word not mine. I’m not going to start a food fight by naming names here, but you can find them without any trouble. Wotts, I left a comment above about what the IPCC AR5 does admit. The problem here is that our uncertainty seems to be growing and I discussed that above. I really am interested in your response. David, the range has got larger and there is no longer a best estimate. However, this is largely because of recent observationally constrained estimates. These estimates differ from paleo-climatological estimates and modelling estimates and that probably explains the lack of a best estimate (i.e., there are now 3 different methods that don’t quite agree). Also, these observationally constrained estimates are sensitive to short-term variations (i.e., aerosols for example) and so many would regard them as not as robust as some of the other methods. So, yes there are estimates that produce lower climate sensitivities. This could imply that climate sensitivity is lower than we had once thought, but I wouldn’t bank on this. It is, for example, very difficult to understand how the ECS could be lower than 2oC. So, maybe lower but not low enough for there not to be quite a lot of warming in the coming decades. A lot of mainstream scientists are saying the IPCC is too alarmist, using their word not mine. I think you’re going to need to provide some kind of evidence for this. There are many also saying that the IPCC is being too cautious. See above. It’s an interesting issue, but I don’t think we assume that this growing uncertainty implies that CS is likely to end up lower than we had previously thought. It’s possible, but not necessarily likely. Uncertainty is not growing. As Wotts quite rightly points out, the *likelihood* of S being right at the bottom of the range given in AR5 is not high. Look to paleoclimate for a hint. Look across the entire Cenozoic and what do we see? We see absolutely no evidence supporting these very low estimates derived from “observational” studies. The clear implication is that they are not especially informative. 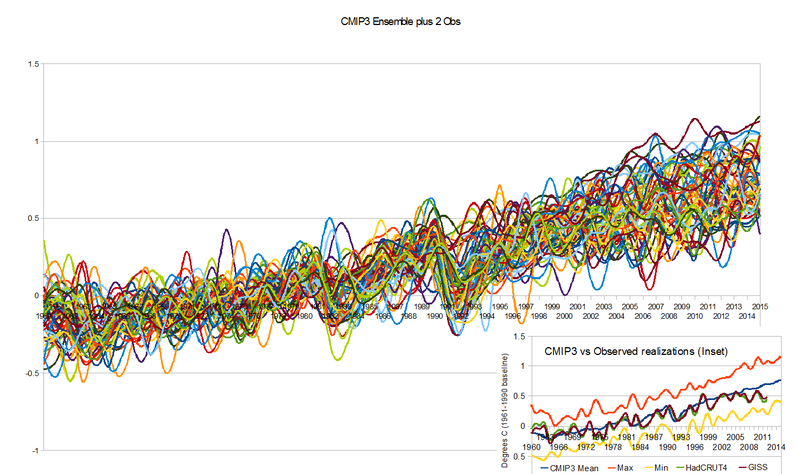 The evidence *all* points to a value for S above ~2C and probably around ~3C. Why people persist in trumpeting apparently uninformative results and ignoring the wall of evidence contradicting them is mystifying. Why, for example, are you doing this, David? Here and elsewhere, persistently and despite repeated correction? OK, Wotts, you are correct, the reason for no best estimate for ECS is the disagreement of different lines of evidence. That presumably was also why the lower value moved lower. There have been some significant changes I think in aerosol research that are causing lower aerosol forcing estimates and that is one reason Lewis and Allen et al arrived at lower estimates. At least that is what Nic Lewis says. The other thing of course is the need to lower the best estimate for 10 years from now from the model mean. And they admit that some models are too sensitive to GHG forcings. Anyway, these things are tacit admissions that AR4 was incomplete or perhaps wrong depending on what terminology you want to use. My own point of view is that GCM’s are pretty flawed, just running a weather model on a course spatial grid with a large time step and hoping for the best. That is why I credit the observationally based estimates. I also believe that modern data is vastly more certain than inferred data from ice cores, tree rings, or sediments from thousands of years ago. Everyone is entitled to their views. If, however, you consider Otto et al. (2013), when they include aeorosols, their ECS rises to 2.4oc. I think one also has to be careful about which aerosols we mean. I may be wrong, but I believe there are natural aerosols (from volcanoes for example) and anthropogenic aerosols (from coal-fired power stations). I’m not sure it’s correct that, overall, the aerosol forcings have been dropping. The other issue is that the observationally constrained estimates clearly can only include fast feedbacks. Longer-term feedbacks cannot really be included simply because of the timescale considered. Overall, you would expect these estimates to be something like lower limits (in my view at least) rather than better estimates than other methods. Even if they aren’t, it’s still at least 2 degrees per doubling. Personally I think the GCMs are better at this than you think. The mismatch we see at the moment is probably simply the influence of short-term variations in surface cooling that the GCMs aren’t capturing accurately – or, at least, when you take ensemble averages you smooth out the short-term variations. I’d be surprised if the long-term trend were significantly different to what GCMs are predicting. It may be true that we’ve got to lower estimates for the next 10 years, but that’s not all that relevant (we should be looking long-term, in my view) and another 1998-like ENSO event could quite easily change that. William Connolley has a useful discussion of Salby here. What I find strange in this whole debate is that we generally seem to accept the notion that humans are adding CO2 to the atmosphere at an alarming rate and this will result in the atmosphere “filling up” with our CO2 emissions. Built on this presumption, we have all sorts of dire predictions including the concept of “global warming” followed by “climate change”. The science controlling levels of CO2 in the atmosphere is well known by gas chemists, and has been since William Henry recorded his thesis in 1803. This is known as Henry’s Law (HL). It is worth noting that the most recent IPCC report does not refer to HL even once in the whole 2,216 pages. HL tells us that the concentration of CO2 in the atmosphere is 100% controlled by the average temperature of the sea. The latest warming scare runs along the lines that AGW is warming the sea – because of increasing levels of our CO2 in the atmosphere. This cannot happen because the sea has to heat first before the atmospheric level of CO2 rises. We can confidently conclude that humans have NO possible influence on CO2 concentrations in the atmosphere, because we do not directly influence sea temperature, and hence there can be no dire consequences from human CO2 emissions – which are simply absorbed and recycled by the sea along with the much larger quantity of naturally produced CO2. Robert, no you’re wrong. You should try reading the post. Given a certain total amount of CO2 and a certain temperature, Henrys Law will determine the atmospheric concentration. If the total amount of CO2 (on short timescales – century or so) is largely unchanged, the variations in the atmospheric concentration will largely be driven by changes in temperature. However, as this post shows (and which is consistent with other work) the variation will be around 10ppm per degree. Humans have added something like 8 GTCO2 (that was once sequestered in fossil fuels) and the new equilibrium (according to Henrys Law) is an atmospheric concentration 120ppm higher than it was in pre-industrial. So, yes the atmospheric concentration today obeys Henry’s Law but the increase is entirely because of anthropogenic emissions and is not a simply a consequence of changing temperatures. Robert, what I find strange is that you have not considered that carbon cycle scientists are not stupid, know Henry’s Law quite well (including its limitations), and therefore know that it does not follow from Henry’s Law that CO2 concentrations can only increase if the ocean warms. Rather, Henry’s Law notes that the solubility of a gas in a solution at constant temperature depends on the partial pressure of the gas above that solution. As Wotts notes, there are three basic parameters in Henry’s Law: c (concentration), p (partial pressure) and k(H) (Henry’s constant). The latter depends on temperature, so c and p will change if you change the temperature. However, at constant temperature one could change c or p and thus see p or c change, respectively. There is thus *no need* to change the temperature to have a change in either c or p! What we have been doing, as humanity, is changing p by adding CO2 to the atmosphere. As a result c has changed, but also T.
Marco, that’s a very good way of explaining that. Thanks. Somewhere, deep down, I still have this idle hope that Robert Beatty also will thank you and me for explaining how he was wrong. Willard, I wonder if everyone involved would find that cartoon amusing. If not, that may – in itself – be telling. Your minion should study its comment section. I love it, Willard. It’s all so true. Sad, but true. And funny. I could probably match up a few of those commentators with ones here but I probably shouldn’t. So I won’t. a) CO2 is very soluble in water and particularly so in sea water which has a pH just over 8.
b) Atmospheric CO2 is always in balance with prevailing sea conditions – there is no extended time lags. A lot of the assumptions are not right. The disconnect between the deep oceans and the top layer is based on water, not gases. It is wrong. Gases will bubble up even though the water does not move. You therefore need to x 50 to get the impact of your 1C. I wrote this in frustration. Yes, I wrote to Murry Salby about all this, but he did not reply. Lord Monckton was far better. This explanation also fits perfectly with Dr Salby;s discovery that global CO2 follows as the intergral of the temperature. Everything fits. None of the CO2 increase is man made, or C14 levels would be 33% lower. The bomb C14 would not have vanished so quickly. It all fits. 1) CO2 does not exist in the ocean in the form of bubbles except near volcanic vents and warming clathrates. Therefore the behaviour of bubbles is irrelevant. What is relevant is rates of diffusion. 2) If you look here, you well see that prior to atomic testing, C14 levels in the atmosphere, as preserved in tree rings, fell well below your “natural level”. As C14 production in the atmosphere was near constant, and if anything slightly increasing due to a warming Sun, that is not what would be expected on your model. The only plausible explanation is dilution due to fossil fuel emissions. 3) Since the end of atmospheric testing, the reduction in C14 has been modeled carefully, including such minor factors as C14 creation near nuclear power plants. Ocean uptake has become an increasingly smaller contributor to the falling trend in C14 over time, and since 1993, has been a smaller contributor than fossil fuel dilution (see fig 4). Without that contribution, the fall in C14 levels cannot be explained adequately. Given these careful studies, I am faced with a choice. Do I believe the back of the envelope calculations of somebody with no expertise, and not publications in the area? Or do I believe findings that the authors believed enough to put before peer review, and which have subsequently been published? I think that’s a no brainer. If you think I am wrong, show the courage of your belief and publish it in a discipline appropriate peer reviewed journal. Absent that publication, the evidence suggests you don’t believe you can convince people who are expert on this issue; so have taken your theory to those without the necessary background to critically examine the theory instead. And for any readers, despite my comment above you don’t need to “trust the experts” on this one because the observations referred to in point to do refute Dr Fagan’s theory outright. Models, models, models. These are not proofs, just self reinforcing confirmations of what people believe, even what they want to believe. You have to stick to the facts, not interpretations of them.. The C14 graph tells you everything you need to know. Yes, I saw the one tree ring analysis 2) showing C14 going down, but it is the only one I could find and the one example where someone actually recognizes that C14 should go down dramatically.if fossil fuel CO2 is added to the air. All other graphs show constant C14. What you want are lots of calculations, models, published papers. What is being presented is simple school level physics. Analysis of the world’s biggest experiment of loading CO2 with a radioactive trace gas in 1965, doubling C14 levels, tells you everything about the real carbon cycle, not the model. The commonly accepted Bern model can neither explain the shape or the curve nor the horizontal asymptote at the historic level of C14. If fossil fuel CO2 was the 50% increase, C14 should be 66% of the historic level for thousands of years. Yes, this does not need super computers or data collection and analysis or learned discourse or years of study of ‘climate science’. It is very simple school level physics and physical chemistry explains where the CO2 went. Not rocket science at all. Then Dr Murry Salby’s amazing graph showing CO2 is an exact match for the integral of the temperature confirms the explanation, that CO2 is a consequence of the heating of the oceans. Remember this is a secondary conclusion. The primary conclusion is that man made CO2 is gone, utterly gone. Matthew, I believe that you’re confusing the residence of an individual CO2 molecule with the time it would take for an enhancement of atmospheric CO2 to decay. These are very different timescales. So the problem with your “stick to the facts” assertion is that if you don’t understand the underlying physics/chemistry then your facts likely tell you very little. Dr Salby’s amazing graph doesn’t really tell us anything other than Dr Salby doesn’t understand this very well (to put it politely). No confusion. Dr Fagan is 100% correct. CO2 is a heavy gas and moves to the sea as surely as river water flows to the sea. The CO2 is then absorbed as per Henry’s Law. The process is always in balance and happens immediately. Robert, what is he correct about? He’s certainly not correct about the rise in atmospheric CO2 since the mid-1800s being natural. It’s all anthropogenic. > You have to stick to the facts, not interpretations of them. Why would we need interpretations when we can access directly to facts? > All other graphs show constant C14. I hope they show that without the mediation of any interpretation whatsoever. Thanks for your comment. The slight rise in atmospheric CO2 since the mid 1800s is all due to a very small rise in the average ocean temperature. This can be caused by increased movement along the Mid Atlantic Ridge,which is intermittent, or slightly increased submarine tectonic activity generally. One thing we can be sure of is we have absolutely nothing to do with it. Your theory as to a mechanism is falsified in that geothermal heat would need to increase two fold to account for the modern warming. It is further falsified in that the warming of the oceans is from the top down, rather than from the bottom up as your theory supposes. It is neither science nor scepticism to simply propose at theory and accept it as correct without determining the (numerical) predictions of the theory and checking them against observations. You, quite plainly, have done neither. Your theory collapses instantly when you do so. R. Beatty: CO2 is a heavy gas and moves to the sea as surely as river water flows to the sea. Fascinating. I’ve noticed that the west coast of British Columbia (Canada) is favoured with extremely rich plant growth, especially the towering cedars and hemlock, and a wealth of attractive and varied undergrowth. This is surely explained by the increased plant production promoted by elevated CO2 concentration at sea level, as you describe above. Do you think the increased CO2 would also explain the lethargy I feel when I first arrive at the coast? I had thought it was my mother’s mince pies, but I’m prepared to change my opinion if necessary. Thanks to Tom Curtis and Mr Ball for your comments. Tom, “your suggestion is falsified by the increasing pCO2 in the ocean, whereas your suggestion predicts decreasing pCO2.” Warmer sea means more CO2 stays in the atmosphere. The CO2 in the sea is irrelevant as the sea has an enormous capacity to absorb CO2 and continuously discharges it through natural processes associated with the resident biota. Your other comments make no sense to me. Mr Ball, I would stick to your mother’s mince pies logic. Tom Curtis, “CO2 is called a Well Mixed Green House Gas (WMGHG) because it is well mixed.” This only occurs in gas concentration levels controlled by Brownian motion. At higher concentrations such as straight out of an exhaust pipe, it will drop like a brick as soon as it cools down. Funny to see a nuclear physicist disparage models and then refer to basic physics (which is all models). Equally funny to see Fagan tiptoe around Tom Curtis challenge to publish (should be easy if it is such easy physics). Beatty’s last comment is a true howler. I laughed, until I realized he was being serious. 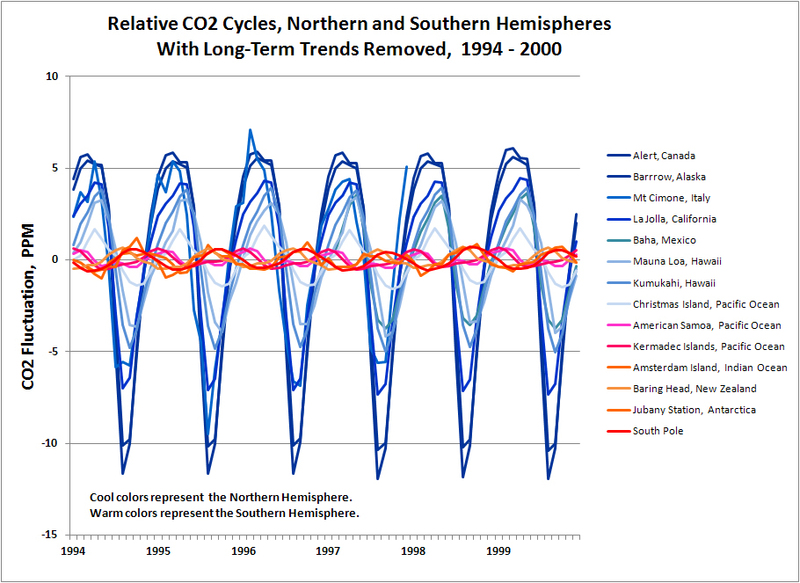 Thanks Mr. Curtis – that first NOAA graph answers any residual concerns I had. This only occurs in gas concentration levels controlled by Brownian motion. I’ll be sure to avoid any low-lying areas on my way home. Messrs Curtis and Ball. You raise an interesting question with the NOAA graph. It shows a sudden drop during the southern mid winter months. This is when the southern ocean is at its coldest and katabatic winds are forming on the high Antarctic Plateau. This wind draws air from the stratosphere before racing across the cold southern ocean, thereby presenting large quantities of fresh air to the cold sea surface. A CO2 drop of around 5ppm is recorded in global CO2 readings over a three month period, before a gradual return to the slow general upward CO2 trend. Many operators of IC engines have wished they had avoided low lying areas when using these motors. For fire fighters CO2 is the gas of choice to attack the seat of a fire. Robert Beattie, any moderately heavy gas in high concentrations will displace oxygen, and if not well ventilated will take a significant time to disperse. That creates the risk of suffocation. That includes nitrogen (N2) which is lighter than oxygen, but still poses a risk if dispersed into still air. On the other hand, with even minimal ventilation CO2 presents no risk because it will be dispersed (except in the rare cases of pure CO2 in large quantities in still air). I can attest to that directly, having worked several times three floors down in a basement carpark, with very high activity and no ventilation. I kicked up a major stink about it with WH&S, but I did not die as your theory requires. Tom Curtis, you have some salutary industrial experience with CO2. As a miner I was trained to be alert when walking down a tunnel if I felt cold rising up my legs. This is a indication one is walking into a CO2 concentration and should exit the drive quickly. Worth noting submariners reportedly use 8,000ppm as a design limit. Of more relevance to this discussion topic is the part CO2 dissolved in the ocean can play. The majority of CO2 reports as the bicarbonate radical (-HCO3) in sea water. This is stable up to 50oC. Above that temperature it dissociates back to CO2 gas. The hottest sea surface temperature recorded is around 38oC. However, if a large asteroid impacts the ocean it will cause a thermal shock and release very large quantities of CO2 – sufficient to suffocate all air breathing animals living at the lower altitudes. The excess CO2 will only stay in the air for a few days, but sufficient time to result in a major extinction event. Have a good weekend and keep an eye on the sky. Robert, this is getting a little tedious. There is virtually no chance whatsoever that the rise in atmospheric CO2 is not anthropogenic. There are multiple lines of evidence that support this. There is no known way in which nature could have produced such a rise. If you have nothing better than “CO2 is a heavy molecule” I would ask that you refrain from adding additional comment. The geological record shows the atmospheric CO2 has usually been noticeably higher then it is today, and certainly without any help from humans. Henry’s Law tells us that the sea temperature must also have been mostly higher than it is today. You will have to prove that human activity raised the average sea temperature before attributing a high atmospheric level of CO2 to an anthropogenic cause. No, during the past 500000 years CO2 has not been higher than it is now. It has been higher prior to this period, however, this was – I believe – a consequence of volcanic outgassing. Henry’s Law tells us that the sea temperature must also have been mostly higher than it is today. You will have to prove that human activity raised the average sea temperature before attributing a high atmospheric level of CO2 to an anthropogenic cause. No, I think that doesn’t actually make sense. You seem to be arguing that we must show that humans caused an increase in sea temperature to explain a rise in atmospheric CO2 that is not a consequence of a rise in sea temperature. In fact, Henry’s Law doesn’t tell you that. Henry’s Law tells you that the concentration in the liquid depends on the partial pressure in the atmosphere and on a coefficient that depends on temperature. The atmospheric concentration then depends both on the total amount of CO2 in the system and on temperature. It doesn’t need the temperature to rise in order for the atmospheric concentration to rise. It could rise because the total amount of CO2 has increased. Could that be the reason? I’ll let you think about that for a while. Right. Bicarbonate radicals. Nope. Stable up to 50 degrees in water. Nope. It’s all in an equilibrium with in that temperature range no specific transitions. Perhaps (read: most likely) you have mistaken the melting temperature of sodium bicarbonate with the stability of bicarbonate in water. The two are not related. Not at all. Henry’s Law does not state that sea temperatures must have been higher if CO2 concentrations in the atmosphere have been higher. There are THREE variables in Henry’s law. It is true that temperatures were higher when CO2 was higher, at least in the more recent times (say, up to a few hundred million years ago), but that was related at least in part to the higher CO2. And as people already noted, Wotts himself, notably, Henry’s Law shows us that the current increase in CO2 cannot come from the oceans, as those would have had to warm up by more than 10 degrees. I did not respond previously to the latter comment, and was hoping someone else would write to correct this calculation. Atlantic Ocean alone is sufficient to cause this effect. Atmospheric concentration of CO2 is very sensitive to small changes in sea temperature. If you want to follow the details check out http://www.bosmin.com/SeaChange.pdf I think most of the other points are covered in previous posts on this subject, so I will be signing off now and following other pursuits. Thanks to all for your interest in Henry’s Law. Which brings us to the big question. What caused the ocean to warm? What caused energy to accumulate in the climate system? Another question is if the 67 ppm rise in CO2 concentration over the past 50 or so years is due to CO2 coming from the oceans, where did the approximately 67 ppm CO2 from burning of fossil fuels go? I’m afraid Dunning Kruger has afflicted Robert Beatty in a significant way. Ian Forrester, not approximately 67 ppmv of emissions, but 149 ppmv of emissions, 82 ppmv of which have been drawn down by natural sources. Robert Beatty owes us an explanation of where the excess 149 ppmv of emissions (based on his theory) have gone. I expect no such explanation will be forthcoming, for he is not interested in understanding the system, but in concluding that humans are not responsible for global temperature increases. Yes Tom, i realized afterwards that I had overlooked about half the CO2 from fossil fuel. “The 5.6 ppm variation noticed at Mauna Loa should be regarded as a function describing the level of atmospheric resistance experienced when annually migrating large volumes of CO2 to equal 218 ppm between the northern and southern hemispheres. Of course, anybody with even a passing knowledge of the global CO2 record will know where I am going with this. (See also here) I just wanted to get the howlers right their in print before your eyes. 6) In the high latitude SH (ie, the Southern Ocean), the highest CO2 concentrations are found in the SH winter, and the lowest in the SH summer, the opposite to that which is conjectured as the basis for the theory. The last is particularly interesting in that it shows seasonal variations from plant growth in the SH, even with the very few land masses, are still sufficient to dominate the temperature driven variation from the Southern Ocean. That in turn shows Beatty’s calculations of expected outgasing with ocean temperature rise are out be at least an order of magnitude. There are two distinct issues. The first is whether CO2 from fossil fuels is still around. It isn’t. You do not need to be a great scientist to understand what the C14 bomb graph tell you about the fate of all CO2. C12 is 99%, C13 is 1%, C14 is 1×10-12%. What happens to C14 happens to all CO2. Once that is accepted you have the question of what caused the recent increase in CO2. That is where global warming comes in. The warming oceans release CO2. Then it is amazing how many things are really simple to explain. What is odd is that so many scientists have taken this view that if two things go up together one must cause the other. A scientist should not accept that increasing CO2 causes global warming when it is just as likely the other way around? . Dr. Murry Salby’s has shown that the integral of Temperature is a perfect predictor of CO2 concentration and you have your proof.that increasing temperatures causes CO2 outgassing. Not air temperature, but total heat injected into the ocean, which is the integral of the incident sunlight. No surprise really. In all this, the simplest explanation is usually the right one. The Egyptians created amazing brass models to predict the movements of the stars. The models would have been much simpler if they had put the sun in the centre and not the earth. Matthew, it is indeed largely true that much of the CO2 from fossil fuels is no longer in the atmosphere. That, however, is simply because of the carbon cycle. It does not imply that the enhanced atmospheric CO2 concentration is not anthropogenic. One of the problems you face is that the relationship between temperature and atmospheric CO2 concentration is insufficient to explain the rise in atmospheric CO2. Another is how you explain that all the reservoirs (oceans, atmosphere, biosphere) see increased levels of CO2. Dr. Murry Salby’s has shown that the integral of Temperature is a perfect predictor of CO2 concentration and you have your proof.that increasing temperatures causes CO2 outgassing. I presume you’ve heard the correlation causation argument before, so I won’t repeat it here. There are two types of man made CO2. Zero C14 from fossil fuel and after the bomb, C14 doubled. The C14 doubled goes went into the ocean, half gone in 14 years. There is no other place. However it does not reappear. So much for combing back in equilibrium. The asymptote of the graph is the ages old historic value, neither an enhanced value because of the recent doubling, nor 33% lower because of the lack of C14. There can be only one conclusion. The oceans are so vast and the CO2 so diluted, that effectively it vanishes. First problem: the relationship between atmospheric CO2 and temperature. There is none, if you watch Dr Salby’s lecture in Hamburg on youtube. He was fired for this and other talks where he told the truth as a climate professor.. However he discovered there is a perfect relationship between the time integral of global temperature and CO2. That indicates warming. All reservoirs increasing would make sense as the fossil fuel has been out of the system for millions of years. No surprises there. Separate issue. If the CO2 goes into oceans, 50x larger, the same CO2 will not be seen for a very long time. Goodbye man made CO2. As for the total concentration of gas above a liquid, this is all schoolboy stuff. What matters is that the ratio of concentrations which is maintained. As what is in the water is 50x this dominates everything. Henry’s law says that the exchange is controlled by temperature. That is true, unless someone would have that this absurdly simple law does not apply? “It does not imply that the enhanced atmospheric CO2 concentration is not anthropogenic”. You can determine that for yourself. If the CO2 concentration was from fossil fuel, the C14 level would be 2/3 of its current value by dilution with 50% extra fossil fuel CO2. There is no law which says that CO2 taken from the air should be exactly replaced, like banking. No what matters it he relative concentrations, not the total amounts. You can pump as much CO2 as you like in the air, the total will be set by Henry’s law. One point which may not be clear. In Murry Selby’s lecture, the temperature he measures is Global Temperature, I assume air temperature. This varies dramatically. The oceans vary far less. My conclusion is that the integral of air temperatures averaged out, is rising perfectly with CO2 in the air. This looks pretty obvious rather than accidental. The fit is perfect. To explain why the oceans dominate. Consider doubling CO2 by burning everything today. Now into the oceans. A doubling adds a mere 2% to what is already there, and the increase after the exchange is an increase of only 2/50 or 4%. This has been confirmed by the inventors of radio carbon dating who found that the industrial gases since 1890 and including WWI, WWII reduced C14 levels by 1-2%. That is because the C14 free gas disappeared into the oceans to be replaced by older CO2 with the right C14 levels. In effect I am answering the question: Can we tell whether the carbon dioxide increase in the 20th century is man made? Using radio carbon dating, my answer is Yes and it isn’t. My conclusion is that the integral of air temperatures averaged out, is rising perfectly with CO2 in the air. This looks pretty obvious rather than accidental. The fit is perfect. I’m not sure the fit is perfect. What about the possibility that it is CO2 that is driving the rise in temperature? That would at least be consistent with basic physics. Can we tell whether the carbon dioxide increase in the 20th century is man made? Using radio carbon dating, my answer is Yes and it isn’t. Dr. Salby shows that graph, CO2 against Global Temperature plotted against time.. There is no correlation. The theory is busted. That is in the Heidelburg video. However if you consider that CO2 is drive by temperature, the theory fits the facts, except that it is ocean temperature, not air temperature. The temperature of 4.2Km (3 miles) of water covering 2/3 of the planet is far more important than the thin layer of air above, air which can freeze in a night..
PS. 10 metres=1 amosphere, so the oceans are 400x heavier and full of air. That is how fish breathe. The sea is full of O2, although you cannot see it. PPS. I am fascinated that we operate the same way. Try holding your breath for very long. No one can.. Air is 22% O2 and 0.04% CO2. When we breathe out it is humid, 14% O2 and 5% CO2. This happens on every breath, so the process is incredibly fast. It all depends on Henry’s law. The high concentration CO2 leaves and new O2 arrives. Our lungs have a wet area 40x our total skin area too. So we live and breath Henry’s law and this law determine what proportion is on each side of the boundary, not how much we put on one side..
Dr. Salby shows that graph, CO2 against Global Temperature plotted against time.. There is no correlation. The theory is busted. I would recommend you check the y-axis scales on that graph. With a suitable choice of y-axis scales, I can make anything look as though there is no correlation. Perhaps I could just compare the amounts of CO2. (this is all in my blog http://www.globalcarbon.blogspot.com) We generate 36 Billion tons of CO2 a year. Sounds a lot? Estimates of CO2 in the ocean are 100,000 billion tons, so 3,000 bigger. No, they are not the same shape. The axes are irrelevant. We generate 36 Billion tons of CO2 a year. Sounds a lot? Estimates of CO2 in the ocean are 100,000 billion tons, so 3,000 bigger. And, yet, it’s increasing. How is that possible if it is the source of the increased atmospheric CO2 concentration? Salby makes the point that every computer model shows perfect correlation between CO2 and temperature. They are identical. He then shows the real graphs, which are totally different. The axes are not totally irrelevant because the zeroes have to be the same, but the scaling is.irrelevant. Matthew, how can the axis scaling not be relevant? Here’s a properly normalised version of the same graph. Looks like a pretty good correlation to me. If nothing else, if CO2 was the generator of increased temperature and nothing else, temperature would track CO2 concentrations. It doesn’t and in particular even the IPCC finally admitted that there has been a ‘pause’ in warming for 18 years, almost as long as this whole thing has been going on. So there has been no global warming for 18 years but CO2 levels are rising faster than ever. If we get an ice age, CO2 levels will plummet as always. The old idea that we could pump CO2 into the air to prevent an ice age was just wrong. Too bad really. Matthew, noone is claiming that the only thing that can cause surface temperatures to change is CO2. CO2 acts to trap outgoing long-wavelength radiation causing the energy in the climate system to increase. Most of this energy goes into the oceans, some heats the land and atmosphere. However, the surface temperatures are – on short-timescales – sensitive to internal variability and hence we don’t expect surface temperatures to perfectly track the rise in CO2. There has been global warming for the past 18 years. The Ocean Heat Content continues to increase, Arctic sea ice is dropping, and surface temperatures do continue to rise, just slower than was expected. It’s Sunday and, with all due respect, I don’t really feel like spending it debating with someone who does not appear to understand the basic physics associated with global warming. It is very clear from this that the graph that the cumulative emissions is a far better predictor than any integral of temperature. It is true that the integral of temperature relative to the 1900-08 mean gives a high r^2 of 0.962, but that is still significantly less than the 0.994 for cumulative emissions. Further, the integral of the anomaly with respect to 1900-08 has a RMSE of 4.82, compared to the 0.9 for cumulative emissions. The only way Salby’s claim that the integral of temperature is a better explanation of the rise in CO2 levels is if you very carefully avoid checking the theory against the alternatives. Fagan has that avoidance down to a fine art. Hmm, where does the IPCC say there’s been a pause for 18 years? Next, why is ocean pH decreasing, if the CO2 in the atmosphere is coming from it rather than human sources? If this is indeed what Salby says, he is lying. Lying because he should definitely know better. 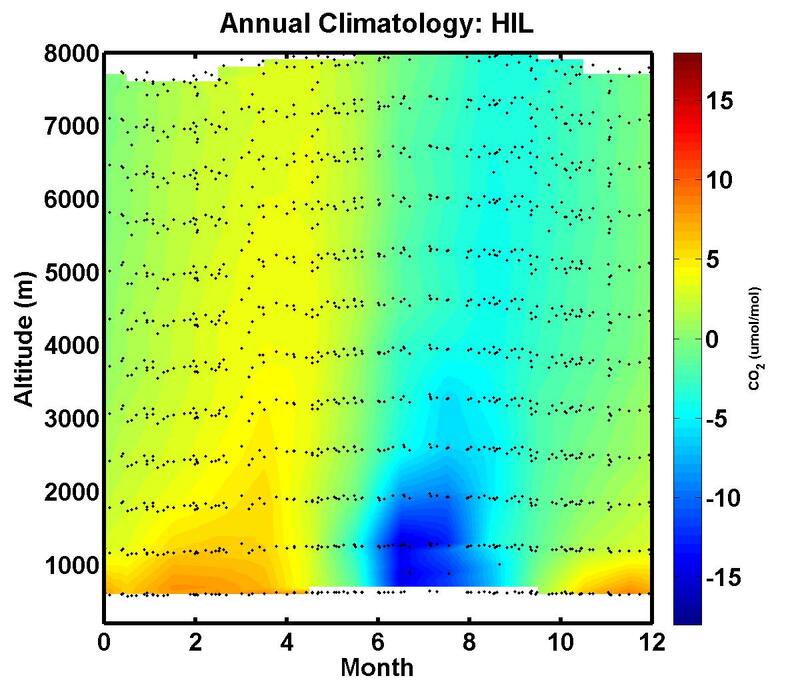 GCMs show significant short term variability (with short term being up to 20 years), meaning that individual model runs can easily have periods of 15 years of no warming, despite increasing GHG concentrations. There are plenty of publications out that will show you this, you can check the details at several websites run by climate scientists doing actual modeling, etc. etc. I’m not even going to give references, someone who flaunts his academic title should have no problem finding them – or otherwise return his title. Fagan, Salby deliberately obscures the relationship between CO2 and temperature in the models. He did so by smoothing the graph, without mentioning it, whereas he did not smooth the observations. He did so by taking the mean of many models, whose short term variations do not coincide, and hence cancel each other out, again without mentioning it. Further, he does so by claiming the relationship between CO2 and temperature are “isomorphic”. They are not. Not even on his graph, and most certainly not in the individual, unsmoothed model runs. You can compare actual short term model runs on this graph. No single model is monotonic, nor particularly smooth (despite the running 12 month smooth in the graph), and most definitely none of them is isomorphic with the CO2 record or predictions. Why didn’t Salby show you that? 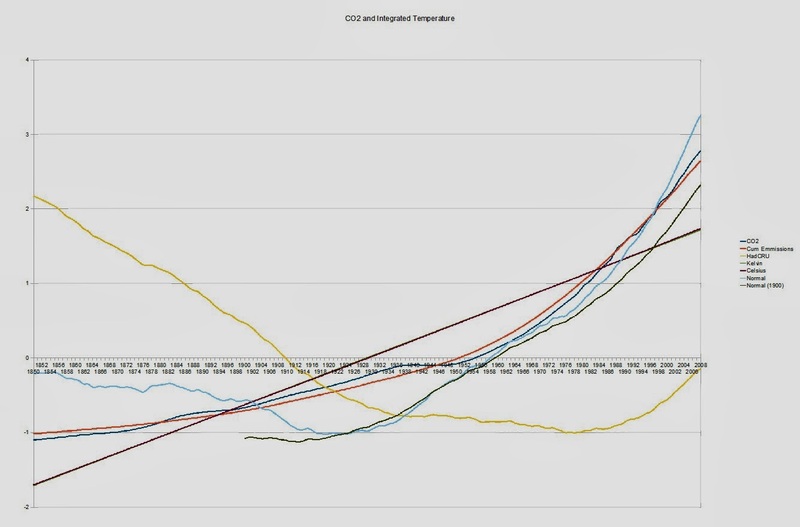 In fact, in this case Salby is little to blame, for while he did make the deceptive comparisons indicated above, he most definitely compared trends, saying that “The long term evolution of global temperature parallels that of CO2 during the 1980s”, when the temperatures are as erratic with respect to the CO2 record as in any other decade. It is telling that you need to misrepresent Salby to defend him. Tom, thanks. I’d never seen that correlation with cumulative emission before. Dr. Fagan: [Salby] was fired for this and other talks where he told the truth as a climate professor. I think you’re trying to convince yourself this is true because your beliefs rely on Salby’s credibility. It appears that Salby left University of Colorado for similar reasons (ie. professional misconduct). I find it very difficult to take your claims seriously when you make faith-based statements about the source of your arguments. I wonder why Dr. Salby isn’t publishing his claims? It doesn’t and in particular even the IPCC finally admitted that there has been a ‘pause’ in warming for 18 years, almost as long as this whole thing has been going on. So there has been no global warming for 18 years but CO2 levels are rising faster than ever. First, where exactly does AR5 WG1 make this statement? Please reference it and quote the original. Thanks. Second, the claim is absolute cobblers. Please look at the data.